Your very own recording companion; just clip and go. Slim and lightweight, about the size of your cell phone. Boasts superb digital recording quality. Headphone jack and large built-in speaker. Adjustable volume and pause feature. Simple operation with only 6 controls. Beeps provide audible feedback when buttons are pressed. Records multiple messages up to 12 hours. Specially designed for the blind, no display screen. Comes with removable belt clip. Features one-year Manufacturer's Limited Warranty, and 128 megabytes of internal memory. Measures about 3 in by 2 in by 1/2 in. Package Weight: about 4.6 ounces. It's a good thing this unit is so easy to take with you, because it's the most versatile digital recorder you'll ever find. It boasts superb recording quality, a large built-in speaker, simple operation, and only six controls. But wait ... there's more! The Deluxe Wilson Recorder is about the size of your cell phone, measuring only three inches long and two inches wide. It looks a lot like a pager, and clips easily to your belt, shirt, backpack, car visor, or purse with a strong spring-loaded clip. It can record for up to twelve hours, supports as many different messages as you need, and boasts a volume control. And yes, if you don't need the clip, it can be easily removed to make the unit even smaller to fit in your pocket. The Wilson recorders are designed specifically for the blind, so they have no display screen. That means there are no confusing menus to get hung up in - they record your voice and play it back at the touch of a button. That's it. In keeping with that theme, you'll find just six controls on this well-built device. To use, simply slide the Power switch on the left side to On, then find the three raised, round buttons in the middle of the unit. Record is on the left, Play is in the middle, and Delete is on the Right. There are even two small buttons on the right side to adjust the volume and skip between messages. Pause with a tap of Play, or hold down Skip to cycle through your recordings. That's it! 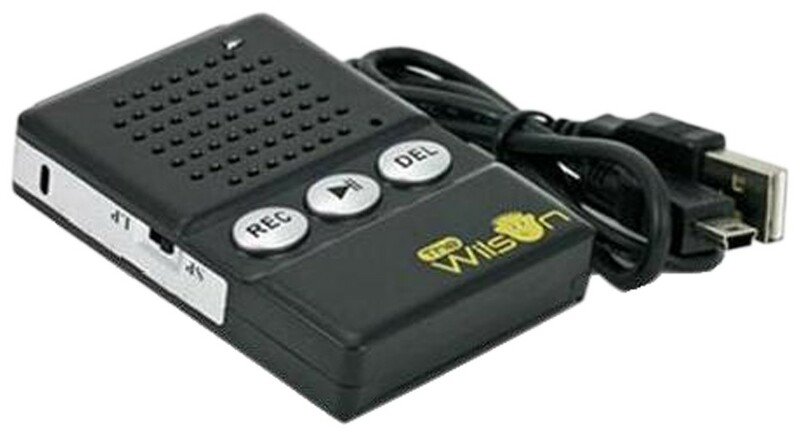 The Wilson� is a state-of-the-art digital voice recorder that is simple to use, feature rich and made from high-quality components. It comes with a one-year Manufacturer's Limited Warranty, 128 megabytes of internal memory, and takes 2 AAA batteries, which are not included. Talk to the Wilson ... he'll listen! He's your recording companion - just clip and go! Please note: the picture of this item shows a USB port, but the picture is outdated. The newer model that you will receive, complete with a Skip button, does NOT have a USB port. Directions for the Deluxe Wilson Recorder From Future Aids, The Braille Superstore. Your Personal Digital Voice Recorder. The Wilson Digital Voice Recorder is a small, simple digital recorder you can use to capture spoken information quickly. Then, at your leisure, transcribe your information into print or braille. To attach the belt clip, squeez the two tabs on the clip and fit them into the indented holes on the top of the recorder. We strongly advise you to follow the included print instructions for this because it's easy to break the tabs if you don't follow them exactly. Battery Installation. The Wilson is powered by two AAA batteries, not included. To install batteries, squeeze the belt clip at the top of the Wilson. On the back of The Wilson, underneath the open end of the belt clip, you will feel several horizontal ridges. The ridges serve as friction grips in sliding the battery compartment cover away from the body of the Wilson. Remove the cover by pulling it down. Place two AAA batteries in the battery compartment. Place the flat (negative) end of each battery against the spring in its section of the compartment. Batteries lie side-by-side facing in opposite directions. Replace the compartment cover and your Wilson recorder is ready to go! Note that when it is time to replace the batteries, The Wilson will retain any existing messages during the battery changing process. *Hint: At the bottom of the raised lines lines is a groove running down the side of the unit. You can insert your fingernail into it and slide the battery compartment towards the end and off the unit. Operating The Wilson. The face of The Wilson has three tactile areas. At the top there is a slightly rough area. This grid of holes is the combination loudspeaker/microphone. Below it are three buttons in left-to-right order. Below the buttons is a smooth visual display that flashes when The Wilson is recording. The left button in the row of three is the RECORD button. Press and release this button to begin recording. When you release the RECORD button, you will hear a beep. This means that The Wilson is recording. If you do nothing, it will record until its memory is full. If set to Standard Play, maximum recording time is 6 hours. Long Play allows for up to 12 hours of recording time. To stop recording, press the middle STOP/PLAY button. You will hear two quick beeps. This means that recording has stopped. Pressing STOP/PLAY a second time will play back the recording that has just been made. If you make a series of recordings, the first press of the STOP/PLAY button will play the most recent recording. Thereafter, your recordings will play in reverse order, backing up one-by-one until you are returned to your oldest recording. If you want to delete a recording you must use the STOP/PLAY button to begin playing the recording. While the recording is playing, press the right-most DELETE button twice rapidly until you hear two quick beeps. This tells you that the recording you were playing has been removed. The need to push the DELETE button multiple times helps ensure that recordings will not be accidentally deleted. On the left side panel of The Wilson there is a Record Quality Selection Switch. When this switch is pulled down in the direction of the smooth visual display, The Wilson is set for Standard Play (marked SP), for 6 hours maximum recording time at a higher quality. Moving this switch upward in the direction of the speaker/microphone sets The Wilson to Long Play (marked LP), for 12 hours maximum recording time at a lower quality. Please note that unless battery power is optimum, SP mode will not work. If your Wilson refuses to record and you have tried replacing the batteries, try recording with this switch set in the LP position. Volume Control. On The Wilson's right side panel there is a playback Volume Control just above the min USB port. When you press this control, you will hear a beep that becomes louder with each press. As you press, The Wilson will continue to the top of its volume level, then return to the lowest volume. This volume control works only for playback and has no effect on recording level. Skip control. Directly below the volume button is the Skip button. If you quickly tap Skip, the Wilson will tell you how many messages you have recorded in a female voice. If you hold down Skip, Wilson will slowly cycle through your messages. As a new message is selected, the female voice will announce its number. When you come to the message you want to hear, release the Skip button and press Play to hear it.